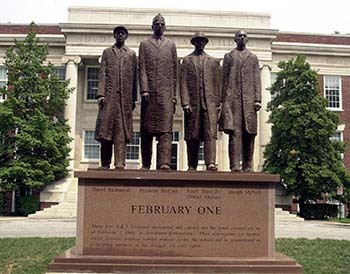 This page gathers resources in NCpedia that broadly cover the history and heritage of the Civil Rights Movement in North Carolina. It does not include all resources in NCpedia but rather a selection that covers important topics and events, including: background articles; events; politics and law; organizations and agencies; biographies; oral histories and personal accounts; and historic sites and monuments. These topics include many aspects of the movement for Civil Rights in North Carolina, including African American, Native American, and Women's history. Grade 8: NC’s Lumbee Fight for Justice:The Battle at Hayes Pond in Maxton, NC. North Carolina Civic Education Consortium. Grade 8: Moments in the Lives of Engaged Citizens who Fought Jim Crow. North Carolina Civic Education Consortium. Cewatkin. "Front view of the A&T Four Statue along with the Dudley Building in the background." Photograph. 2000. https://en.wikipedia.org/wiki/February_One#/media/File:A%26T_four_statue... (accessed April 5, 2016).